Although not as cold as January, February in China is still quite chilly, but this doesn't stop the people of this large Asian country from celebrating its annual Spring Festival in honor of the Chinese New Year—as well as a number of other festive events and parties. However, depending on where you go in the country, the weather varies slightly throughout the month; while the north is cold and dry, central China experiences slightly warmer and wetter weather and southern China can be downright warm but rainy as well. Fortunately, no matter where you go in China, you're sure to find something to do and see this time of year. Due to the large geographic area that China covers—stretching from the far north to the South China Sea—the weather can be drastically different in February depending on where you're going on your trip. While the north often sees freezing temperatures, the southern coast of China is often warm enough to enjoy a day at the beach—even in February. 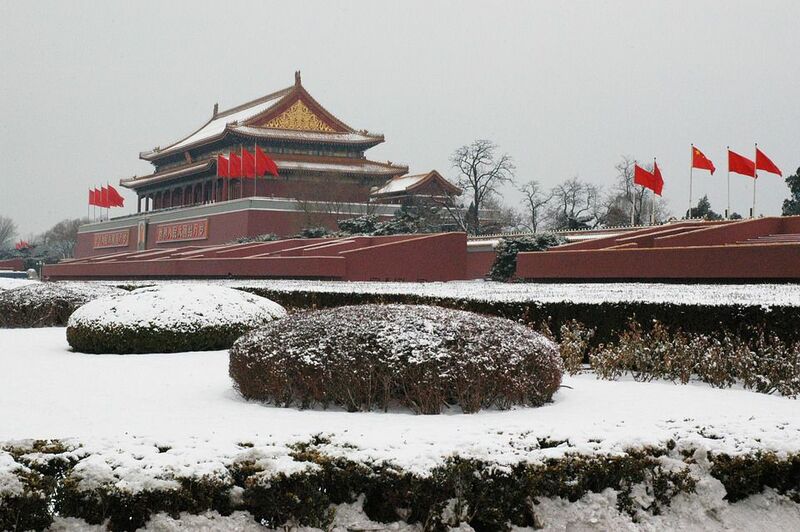 North: In places like Beijing, it will be cold during the day and below freezing at night. You'll probably be thankful if you bring long underwear, a fleece, and a wind-proof or down jacket in addition to sweaters, long pants, scarves, gloves, and a warm hat. Central: Although slightly warmer in cities like Chengdu and Shanghai, it will still be quite chilly during the day and cooler at night, but rarely freezing. A heavy base layer (jeans, boots, and sweaters) along with a rain/wind-proof jacket should be enough to stay warm; if you're easily cold, a down jacket might be better. You will also need to bring an umbrella and waterproof shoes as you will definitely see rain this time of year. South: In places like Guangzhou, it will be cool and rainy but nowhere near as chilly as north and central China. Long sleeves and pants, as well as a rain/wind-proof jacket should suffice to keep you comfortable during your stay. From Chinese New Year—known as the Spring Festival in China—to Valentine's Day events, there are plenty of things happening across the country in February. However, the date for Chinese New Year changes from year to year, so you festivities may not occur during February every year; be sure to check the Spring Festival calendar to see when this annual celebration will occur this year. Chinese New Year/Spring Festival: This 15-day-long celebration features firework shows, parades, lion dances, and performances in cities as well as time-honored traditions of enjoying food, good company, and fresh starts in homes across the country. While events vary slightly by region, most of China celebrates the Spring Festival similarly. Lantern Festival: Marking the end of the Spring Festival, this annual tradition features revelers lighting thousands of paper lanterns and releasing them into the night sky to honor the new year and deceased friends and family. After the event, Chinese New Year taboos are no longer in effect and Spring Festival decorations are taken down from homes and cities across China. The Lantern Festival happens on the first full moon of the Chinese New Year. Valentine's Day: Like elsewhere in the world, Valentine's Day occurs on February 14 in China and is celebrated with chocolates, romance, and signs of affection. However, China also has its own version of this love-centric holiday, the Qixi Festival, which takes place on the seventh day of the seventh month of the Lunar Calendar. Harbin Ice and Snow Festival: The city of Harbin embraces the winter cold (and massive snowfall in the region) by hosting a month-long celebration featuring large ice sculptures created by artists from around the world. Although this annual winter celebration officially ends on in the first week of February, you can still see the sculptures for a few weeks after the close. Dry weather in Beijing and the rest of northern China makes for cold but almost-guaranteed dry sight-seeing; cold weather in central and south China is comfortable for sight-seeing and touring as long as you've brought the right layers. Although February is considered the off-season for tourism in China, the Spring Festival brings international tourists to the country en masse, raising airfare and accommodation prices. If you want to save money but don't mind missing out on the celebrations, you can plan your trip for the end of the month when prices will likely drop. Since there is no official holiday for Chinese New Year, you won't likely have much competition from locals for some of the country's biggest attractions. However, due to the cold temperatures, February is not the best time to travel across the country, even though you will likely see fewer international tourists at local attractions.